(Camden, NJ) – A partnership of organizations joined together at Roosevelt Plaza to launch the first dockless bike share initiative in the state. The Camden Bike Share demonstration, with the support of the Voorhees Transportation Center at Rutgers, and the world’s first and largest dockless bike share company, ofo, will run through September 2018. 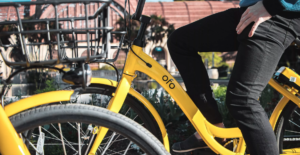 Several hundred bikes were deployed throughout the city today, with ofo’s operations team positioned to fix improperly stationed bicycles, such as those tied to fire hydrants or blocking a sidewalk, in addition to collecting and redistributing them. As avid bike rider and resident of the city, Congressman Donald Norcross talked about the new initiative. The Camden Bike Share demonstration is being implemented to complement a feasibility study of bike share in Camden which has been funded by the William Penn Foundation. ofo’s bright yellow bikes are rented at $1 an hour using the ofo mobile phone application. The service does not use parking docks that line curbs as seen in other cities; instead, customers find an available bike close to them on their phone, enter a code provided by the app to unlock the bike, and push a lever to lock the bike at the end of their trip, leaving the bike behind for the next rider. The bikes have GPS units, allowing customers – and the ofo operations team – to track their location. Users can ride anywhere within the City of Camden limits. According to ofo, some of its partner cities have seen short-distance car trips (under three miles) reduced by as much as 44 percent. To sign up, interested riders can download the ofo application and pay with a debit or credit card. Interested riders without a debit or credit card can purchase a ride “voucher” at the offices of Cooper’s Ferry Partnership. Visit camdenbikeshare.com for more information.